The Lorax | Anime etc. Ted is a boy in the plastic, highly polluted city of Thneed-ville, which he accepts as the normal world. However, he’s hopelessly smitten with an older girl, Audrey, who says she dreams of having a real tree in her garden. Ted’s wily granny tells him to ask the reclusive Once-ler, who lives in the grey wasteland outside the city walls. It’s no insult to say that The Lorax feels happiest when it’s simply being a cartoon. It’s something this CGI film (from Illumination Entertainment, makers of Despicable Me, 2010), does very well. There’s a host of funny animals, while the humans break into hilariously over-the-top songs and dances, and use the Seussian design of their world – all rollercoaster ramps and curves – to dynamic effect. The boy lead, voiced by Zac Efron, bikes over roofs and plunges down cliffs. At one point, he presses a button to spring a plank staircase from a wall, and cycles merrily up it. Later, the dwarf villain goes one better, using his henchmen’s hands as an escalator. 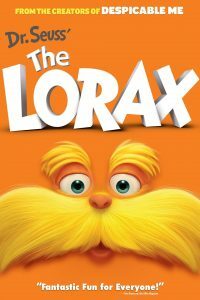 The Lorax, though, is also a cautionary fable, based on Doctor Seuss’s 1971 rhyming lament for the despoiling of nature by Big Business. This film has been denounced on the Fox Network, along with fellow liberal propaganda tracts, The Muppets (2011) and Japan’s Arrietty (2012). More seriously, The Lorax’s images of eco-catastrophe feels heavy-handed and bullying after the previous fun and games, as the light satire suddenly turn into haranguing. Some younger children at the preview screening were bawling at the dark turn. Older kids may feel the film’s just not playing fair. In the story, Efron’s plucky kid in a plastic city ventures into the grey desert without, and learns what blighted the world from a grouchy recluse, the Once-ler (voiced by Ed Helms). This cues a second story, in which Helms’s optimistic bumpkin finds a paradise of happy animals and silky trees and wreaks ecological havoc, at first innocently, then in the knowledge of his crimes. The film cuts between the two narratives, which saps its momentum, especially as we know how the bumpkin’s story ends. There are zany cartoon gags and images – the Lorax generates static electricity by rubbing two hairy bears together, and a sequence with marshmallows is every bit as weird as the cartoon Cloudy with a Chance of Meatballs (2009). However, the story’s main perils are disappointingly standard: a wild river ride, a road chase. The other big problem is the title character, a gruff orange critter with a walrus moustache and Danny DeVito’s voice. Neither asset is enough to make him interesting or fun, especially when he’s set beside singing fish, cute bears and a show-stealing groovy granny (Betty White), who could have have taken over the Lorax’s role completely. Even when he’s playing the role of a voice of conscience, the Lorax has nothing on Jiminy Cricket in Disney’s Pinocchio (1941). The Efron story – invented for the film – has a boy who’s motivated not by morality but rather because he wants to please a pretty girl. Surely the writers could have contrived some dilemma for the lad, illustrating the material costs of doing good, which is a subject that this eco-lesson conspicuously avoids.